The protocol described herein aims to explain and abridge the numerous obstacles in the way of the intricate route leading to modified nucleoside triphosphates. Consequently, this protocol facilitates both the synthesis of these activated building-blocks and their availability for practical applications. Hollenstein, M., Smith, C. C., Räz, M. Nucleoside Triphosphates - From Synthesis to Biochemical Characterization. J. Vis. Exp. (86), e51385, doi:10.3791/51385 (2014). The traditional strategy for the introduction of chemical functionalities is the use of solid-phase synthesis by appending suitably modified phosphoramidite precursors to the nascent chain. However, the conditions used during the synthesis and the restriction to rather short sequences hamper the applicability of this methodology. On the other hand, modified nucleoside triphosphates are activated building blocks that have been employed for the mild introduction of numerous functional groups into nucleic acids, a strategy that paves the way for the use of modified nucleic acids in a wide-ranging palette of practical applications such as functional tagging and generation of ribozymes and DNAzymes. One of the major challenges resides in the intricacy of the methodology leading to the isolation and characterization of these nucleoside analogues. In this video article, we present a detailed protocol for the synthesis of these modified analogues using phosphorous(III)-based reagents. In addition, the procedure for their biochemical characterization is divulged, with a special emphasis on primer extension reactions and TdT tailing polymerization. This detailed protocol will be of use for the crafting of modified dNTPs and their further use in chemical biology. 5'-Nucleoside triphosphates ((d)NTPs) represent a class of vital biomolecules that are involved in countless processes and functions ranging from being the universal currency of energy to regulators of cell metabolism. In addition to their role in these fundamental biological transformations, their modified counterparts have advanced as a versatile and mild platform for the introduction of functional groups into oligonucleotides, a methodology that nicely complements the automated solid-phase synthesis that is usually applied1,2. Indeed, provided the (d)NTPs can act as substrates for RNA and DNA polymerases3, a wealth of functional groups including amino acids4-13, boronic acids14,15, nornbornene16, diamondoid-like residues17, side-chains for organocatalysis18, bile acids19, and even oligonucleotides20 can be introduced into oligonucleotides. Beyond representing a convenient vector for the functionalization of nucleic acids, modified dNTPs can be engaged in SELEX and other related combinatorial methods of in vitro selection for the generation of modified catalytic nucleic acids21-30 and aptamers for various practical applications10,31-36. The additional side-chains that are introduced by the polymerization of the modified dNTPs are thought to increase the chemical space that can be explored during a selection experiment and supplement the rather poor functional arsenal of nucleic acids37. However, despite these attractive traits and the recent progress made in the development of both synthetic and analytical methods, no universally applicable and high-yielding procedure exists for the crafting of modified nucleoside triphosphates2,38. 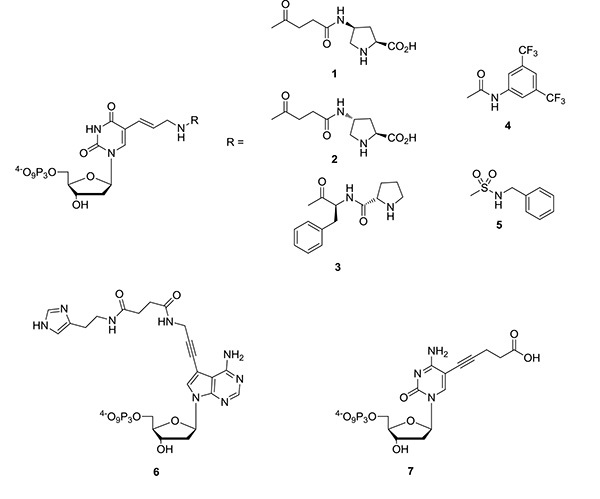 The aim of this present protocol is to shed light into the (sometimes) intricate procedures leading to the synthesis and biochemical characterization of these activated building blocks (Figure 1B). Special emphasis will be given on all the synthetic details that often are difficult to find or are absent in experimental sections but are yet crucial for the successful completion of the synthetic pathway leading to the isolation of pure (d)NTPs (Figure 1). The synthetic approach chosen follows the procedure developed by Ludwig and Eckstein since this method is generally reliable and leads to very few side-products (Figure 1A)39. Coevaporate the suitably 3’-OAc-protected nucleoside ( typically 0.1 mmol) twice with anhydrous pyridine (2 ml) and then dry under vacuum overnight. At the same time, dry tributylammonium pyrophosphate (0.13 mmol) under vacuum overnight. Dissolve the nucleoside in a minimum of dry pyridine (0.2 ml) and add dry dioxane (0.4 ml) as a cosolvent. Finally, add 2-chloro-1,3,2-benzodioxaphosphorin-4-one (0.11 mmol) and allow to react at room temperature for 45 min. Note: It is noteworthy that particular care should be taken with the 2-chloro-1,3,2-benzodioxaphosphorin-4-one reagent. Indeed, even storage of this reagent under an inert gas atmosphere is not sufficient to prevent its decomposition. Thus, the white solid that is formed in this decomposition can and should be scraped off prior to use. Prepare a solution of tributylammonium pyrophosphate in dry DMF (0.17 ml) and freshly distilled tributylamine (58 µl; never add molecular sieves). Add the resulting solution to the reaction mixture (a white precipitate appears but quickly disappears) and allow to react at room temperature for 45 min. Prepare a solution of iodine (0.16 mmol) in pyridine (0.98 ml) and H2O (20 µl) and add to the reaction mixture in order to oxidize the Pα(III) center. Allow the resulting dark solution to stir at room temperature for 30 min. Use a 10% aqueous solution of NaS2O3 to quench the excess I2. Remove the solvent under vacuum (the temperature of the water bath of the rotary evaporator must be kept below 30 °C). Add H2O (5 ml) and allow the mixture to stand at room temperature for 30 min to hydrolyze the cyclic triphosphate moiety. At this stage, the protecting groups are usually removed (i.e. the 3'-OAc and the groups on the side chains of the nucleobase). Consequently, add NH4OH (30% in H2O, 10 ml) to the crude and stir for 1.5 hr at room temperature, and remove the solvent under vacuum. Add 2 ml of H2O and split into 2 tubes. Add 12 ml of a 2% solution of NaClO4 in acetone and centrifuge (1,000 x g) for 30 min. This procedure is repeated one more time. This precipitation allows for the separation of the solvents and reagents used in the synthesis from the triphosphate (which will precipitate), thus simplifying the ensuing RP-HPLC purification substantially. After air-drying of the oily residue, record a 31P-NMR spectrum of the crude (following standard procedures, see also List of Materials and Figure 3) and dissolve in 4 ml H2O. Note: This synthetic procedure mainly focuses on the generation of modified deoxynucleoside triphosphates, but a very similar procedure can be applied for their RNA counterparts (by simply using 2',3'-bis-O-acetylated precursors). Prepare a solution of 1 mole of triethylamine (139 ml) in ≈ 600 ml of distilled and filtered H2O. Bubble CO2 (via dry ice and a gas bubbler) into the solution under vigorous stirring until a pH of 7.6 is reached (this will take at least 10 hr). This stock solution can be stored in the fridge for up to one month. Prepare two buffer solutions from the 1 M stock: 2 L of 50 mM TEAB in ultrapure water (eluent A) and 1 L of 50 mM TEAB in 50% MeCN (eluent B). Degas both eluents under vacuum and stirring for 20 min (careful attention is required so as not to alter the pH by removing CO2 during degassing). Prepare an analytical sample by dissolving 10 µl of the crude triphosphate in 300 µl distilled H2O and inject into an HPLC system equipped with a semi-preparative RP column (C18) and using a gradient ranging from 0-100% B in 40 min (Figure 4). Adjust the HPLC program according to the Rt of the triphosphate (which is usually the main peak on the chromatogram) and the diphosphate (which has a slightly lower Rt). Purify the crude mixture using these conditions and by removing early fractions that might contain some diphosphate. Combine all the fractions that contain the product and freeze-dry (which is preferred to evaporation on the rotary evaporator in order to minimize hydrolysis to the undesired diphosphate). Coevaporate several times with ultrapure water (to remove remnant triethylamine from the eluents). Assess the purity of the triphosphate by NMR (both 1H and 31P NMR) and MALDI-TOF by application of standard protocols (see Figure 5). Typical yields obtained by application of this protocol typically lie in the range of 30-70%, depending on the substrate. Mix 30 pmol of the appropriate primer (e.g. P1, List of Materials) with 4 µl of 10x Polynucleotide kinase (PNK) buffer, 3 µl of γ-[32P]-ATP, 1 µl of PNK, and ddH2O (for a total reaction volume of 40 µl). Incubate the reaction mixture at 37 °C for 30 min and then heat-deactivate the kinase (10 min at 70 °C). During the labeling reaction prepare a G10 Sephadex column by plugging a 1 ml pipette tip with silanized glass wool and filling the tip with G10 solution (10% in ddH2O, autoclaved). Spin down and wash three times with 500 µl ddH2O and one final wash with 50 µl ddH2O. Run the reaction mixture through the G10 (to remove the free radioactive label). Gel purify (PAGE 20%) the radiolabeled primer and recover by application of the crush and soak method (i.e. elution with 500 µl of an aqueous solution containing 1% LiClO4 and 1 mM NEt3 (pH 8) at 72 °C for 15 min). Ethanol precipitate and G10 desalt the eluted oligonucleotide. Anneal 1 pmol of radiolabeled primer P1, 10 pmol primer P1, and 10 pmol of template T1 (List of Materials) in 10x reaction buffer (provided by the supplier of the polymerase to be used) by placing the tube in hot (90-95 °C) water and by allowing to gradually cool down to room temperature (over 45 min). Put the tube on ice and add (in turn) the dNTP cocktail (containing both the modified and the natural triphosphates, 100 µM final concentration) and 1 U of the DNA polymerase (Vent (exo-), Klenow, Pwo or 9°Nm) and complete with water (for a total reaction volume of 20 µl). Incubate at the optimal working temperature of the enzyme (e.g. 60 °C for 30 min when Vent (exo-) is being used). Add 20 µl of stop solution (formamide (70%), ethylenediaminetetraacetic acid (EDTA; 50 mM), bromophenol blue (0.1%), xylene cyanol (0.1 %)), heat the samples (95 °C, 5 min), cool down (0 °C), and resolve by denaturing polyacrylamide gel electrophoresis. Visualize by phosphorimager. Dilute 7 pmol of single-stranded, unlabeled primer P2 (List of Materials), 1 pmol of radiolabeled primer in 1 µl TdT buffer 10x. Put the tube on ice and add (in turn) the dNTP cocktail (at an adequate concentration comprised between 10 and 200 µM) and the TdT polymerase (4 U). Incubate at 37 °C for 1 hr. 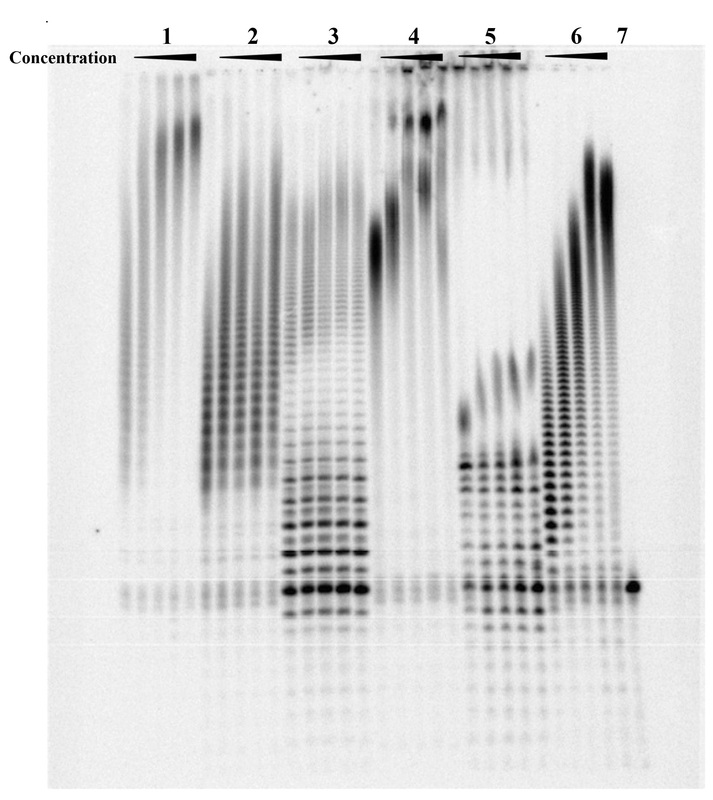 Add 10 µl of the stop solution, heat the samples (95 °C, 5 min), cool down (0 °C), and resolve by denaturing polyacrylamide gel electrophoresis (PAGE 15%). Visualize by phosphorimager. Mix 8 pmol of both the forward and reverse primers with 0.5 pmol of the template to be amplified. Add 10x reaction buffer and the dNTP cocktail (for a 200 µM final concentration) and put the tube on ice. Add 1 U of the DNA polymerase and complete with H2O to reach a final volume of 20 µl. Transfer the mixture into a PCR vial and carry out 30 PCR cycles. 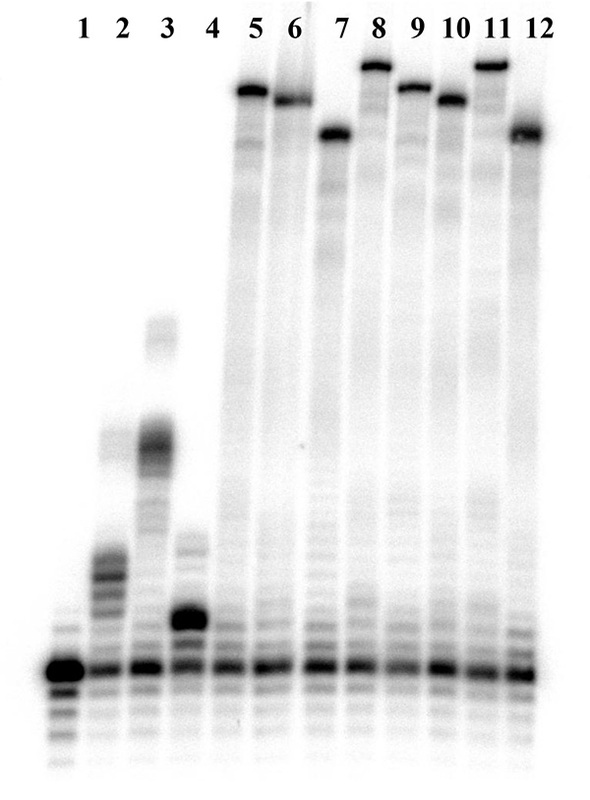 Dilute 6 µl with 6 µl of 2x sucrose loading buffer and resolve by agarose 2% (stained with ethidium bromide) electrophoresis. Visualize by phosphorimager. Modified nucleoside triphosphates are alluring synthetic targets since they allow for the facile introduction of an vast array of functional groups into nucleic acids41. However, the isolation and characterization of these activated building blocks is often revealed to be arduous. Consequently, the results shown herein are thought to provide a helping hand to follow the various steps within the aforementioned synthetic and biochemical procedures (Figure 1B). In particular, Figure 3 shows a typical crude 31P-NMR spectrum of a modified dNTP (in this particular case, dUBpuTP (4)18, Figure 2), where the characteristic signals of the phosphorous centers can be observed (i.e. a doublet at -5.02 (Pγ), a doublet at -10.44 (Pα), and a triplet at -20.55 (Pβ) ppm). In addition, signals stemming for the diphosphate (two doublets at -4.84 and -10.63 ppm) and monophosphate (singlet at -0.18 ppm) side-products along with higher phosphates (signals at -21.02 and -23.19 ppm) are always observed at this stage. 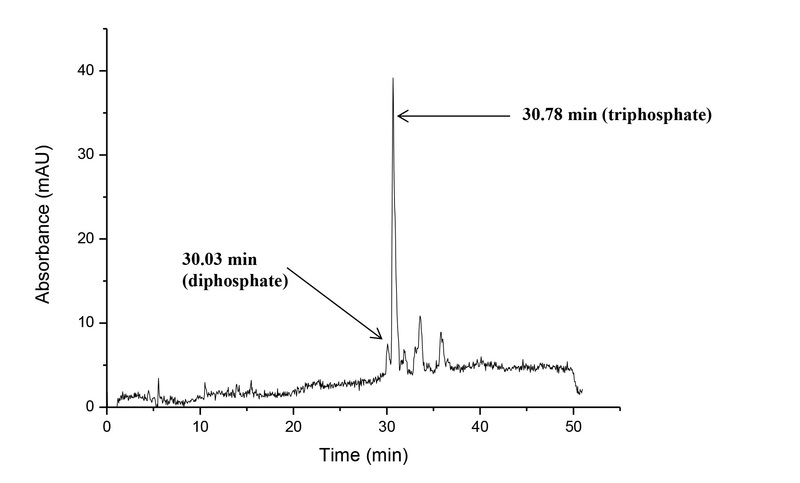 A first RP-HPLC analysis of the crude mixture is shown on Figure 4 (for dUBpuTP (4)) where the main peak (Rt = 30.78 min) corresponds to the 5'-triphosphate, while the main byproduct, the 5'-diphosphate, displays a slightly lower retention time (Rt = 30.03 min). Finally, after a thorough RP-HPLC purification, the modified dNTP needs to be characterized by NMR and MALDI-TOF (Figure 5). Both the 1H-NMR and 31P-NMR spectra are crucial for assessing the purity of the modified dNTPs, since the presence of undesired di- and mono-phosphates gives distinctive signals. After establishing the purity of the nucleoside analogue and assessing the concentration of the stock solution either by mass or by UV-spectroscopy, the modified dNTP can be used in primer extension reactions in order to assess its substrate acceptance capacity by various polymerases. Figure 6 illustrates the outcome of primer extension reactions with dUtPTP (2), dAHsTP (6), and dCValTP (7) used either as lone modifications (lanes 5-7), as combinations of two modified dNTPs (lanes 8-10), or together along with the lone natural dGTP (lane 11). Finally, Figure 7 shows representative TdT-mediated polymerization reactions with different modified dUTP analogues. In this context, dUcPTP (1) and dUFPTP (3) are the best substrates for TdT (lanes 1 and 4) since the tailing efficiencies are comparable or exceed those of the natural dTTP (lane 6). Instead, dUBpuTP (4) (lane 5) is a rather poor substrate in this context since little polydisperse longer-sized oligonucleotides can be observed. Figure 1. A) Ludwig-Eckstein approach for the synthesis of (base) modified nucleoside triphosphates39. B) Schematic representation of all the steps required for the synthesis and biochemical characterization of modified dNTPs prior to their use in applications such as SELEX. Click here to view larger image. Figure 2. Chemical structures of the modified nucleoside triphosphates: dUcPTP (1), dUtPTP (2), dUFPTP (3), dUBpuTP (4), dUBsTP (5),18 dAHsTP (6), and dCValTP (7) 13. Click here to view larger image. Figure 3. 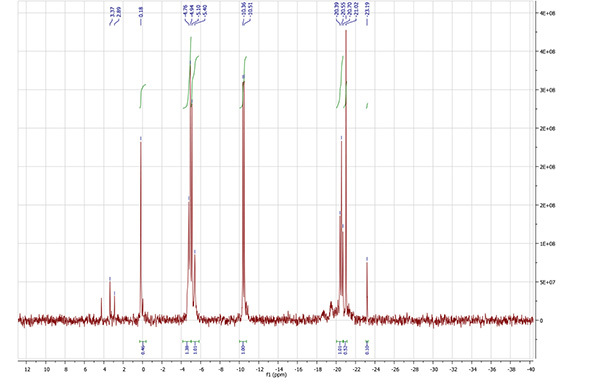 31P-NMR spectrum (121.4 MHz, D2O) of the crude reaction mixture of dUBpuTP (4). Click here to view larger image. Figure 4. 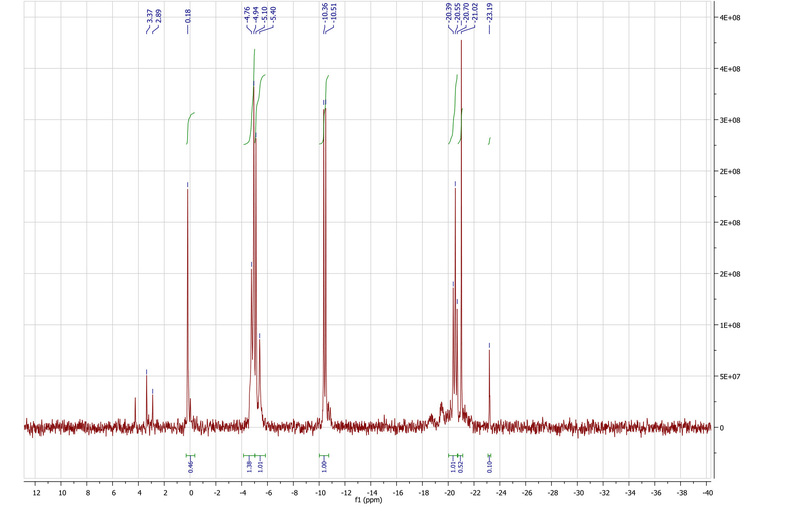 RP-HPLC profile of crude dUBpuTP (4): 0-100% eluent B in 40 min, flow rate: 3.5 ml/min (eluent A: 50 mM TEAB in H2O; eluent B: 50 mM TEAB in H2O/CH3CN (1/1)). Click here to view larger image. Figure 5. 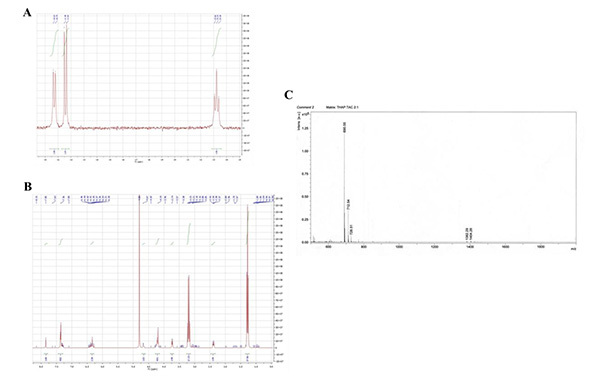 Characterization of the modified nucleoside triphosphate dUBsTP (5): A) 31P-NMR spectrum (121.4 MHz, D2O, 128 scans);18 B) 1H-NMR spectrum (300 MHz, D2O, 128 scans); C) MALDI-TOF spectrum. Click here to view larger image. Figure 6. Representative gel image (PAGE 15%) of primer extension reactions with various base modified dNTP analogues. Lane 1: primer; lane 2: natural dNTPs without dUTP; lane 3: natural dNTPs without dATP; lane 4: natural dNTPs without dCTP; lane 5: dUtPTP (2); lane 6: dAHsTP (6); lane 7: dCValTP (7); lane 8: dAHsTP (6) and dUtPTP (2); lane 9: dAHsTP (6) and dCValTP (7); lane 10: dUtPTP (2) and dCValTP (7); lane 11: dUtPTP (2), dAHsTP (6), and dCValTP (7); lane 12: natural dNTPs. Click here to view larger image. Figure 7. Gel image (PAGE 20%) of the TdT polymerization reactions with various base modified dUTP analogues. Lane 1: dUcPTP (1); lane 2: dUtPTP (2); lane 3: dUBsTP (5); lane 4: dUFPTP (3); lane 5: dUBpuTP (4); lane 6: dTTP; lane 7: primer. Concentrations: 10 µM, 25 µM, 50 µM, 75 µM, and 100 µM. Click here to view larger image. The inclusion of modifications into nucleic acids is of interest for numerous practical applications including the development of antisense and antigene agents42,43, labeling and functional tagging of oligonucleotides41, and in efforts to expand the genetic alphabet44-46. Chemical alterations and functional groups are usually introduced into nucleic acids by application of standard and automated solid-phase synthesis protocols. However, the phosphoramidite building blocks need to be resilient to the rather harsh conditions imposed by this methodology, which in turn imposes a severe restriction onto the nature of the chemical functionality47. Instead, the enzyme-mediated polymerization of modified nucleoside triphosphates allows for the introduction of a broader range of functionalities, since the sole restriction is that they act as substrates for polymerases1,2. Even though there is a noticeable lack of generally applicable methodology, reliable and robust synthetic and analytical methodologies have been developed for the synthesis of modified dNTPs. Moreover, due to their inherent nature, modified triphosphates are rather sensitive to different external conditions (e.g. pH, temperature) and thus, a detailed protocol for their synthesis and characterization is highly beneficial. The workflow presented herein includes the chemical synthesis of modified dNTPs, RP-HPLC purification, NMR analysis, and enzymatic assays for the biochemical characterization of these nucleoside analogues. The most critical steps for a successful synthesis and characterization of modified dNTPs are the analysis of the crude product (by NMR), the thorough HPLC purification, the analysis of the purified material, and choice of an appropriate DNA (RNA) polymerase. For the synthesis of the modified dNTPs we applied the method developed by Ludwig and Eckstein39, since fewer by-products are formed as compared to other procedures, albeit at the expense of a slightly longer synthetic route. Furthermore, the RP-HPLC purification certainly represents the pivotal step of the entire synthetic route since it will allow for the separation of the nucleoside diphosphates (dNDPs) which often strongly inhibit DNA and RNA polymerases48. After achieving the synthesis and purification, the purity of the resulting triphosphate needs to be assessed both by NMR and MALDI-TOF to ensure that no polymerase-inhibiting diphosphate is present. The incorporation assay shown in Figure 6 clearly underscores the usefulness of this approach. Indeed, all of the dNTPs employed in this representative example reveal to be good substrates for the DNA polymerase (in this particular case Vent(exo-)) since no faster running bands corresponding to smaller fragments could be observed. Besides, the enzyme tolerates two substrates adorned with carboxylic acid residues (dUtPTP (3) and dCValTP (7)) and the polymerization of both dNTPs results in an oligonucleotide bearing not less than 39 additional negative charges. Another striking feature is that the bands resulting from the incorporation of modified dNTPs often display slower electrophoretic mobilities than the natural controls (compare e.g. lanes 11 and 12). Thus, primer extension reactions represent a powerful and yet simple way to assess the substrate acceptance of modified dNTPs. Moreover, the TdT-mediated polymerization of triphosphates on the 3'-termini of single stranded oligonucleotides is an alluring strategy for the generation of highly functionalized nucleic acids49-52. The representative example shown in Figure 7 clearly demonstrates the procedure for selecting the functionalities that are tolerated by the Co2+-dependent TdT53. Indeed, dUcPTP (1) and dUFPTP (3), which are equipped with the proteinogenic amino acid L-proline and the dipeptide α-Phe-Pro, respectively, are the best substrates for the TdT and gave rise to tailing efficiencies that compare favorably to the unmodified dTTP control, even at concentrations as low as 10 µM (lanes 1 and 4). Surprisingly, analogue dUtPTP (2) where the proline residue is connected to the linker arm in trans compared to the free carboxylic acid, is not as good a substrate as its cis counterpart since polydisperse longer-sized oligonucleotides are only observed at higher dNTP concentrations (> 100 µM, lane 2). Furthermore, the sulfonamide-modified dNTP 5 is a moderate substrate for TdT and comparable to dUtPTP (2) (lane 3). In addition, dUBpuTP (4), which bears a strong hydrogen-bond donating motif, is a rather poor substrate for TdT and the polymerization reaction seems to be indifferent to the concentration of the modified dNTP. Thus, the following order of substrate acceptance can be construed from Figure 7: dUcPTP (1), dUFPTP (3)> dUtPTP (2), dUBsTP (5) > dUBpuTP (4). Finally, the procedure described for polymerization reactions under PCR conditions using the modified analogues is rather similar to that involving natural dNTPs. However, the compatibility of modified dNTPs with polymerases under these conditions is of crucial importance for the generation of high-density functionalized nucleic acids7, especially with regards to their use in in vitro selection experiments. 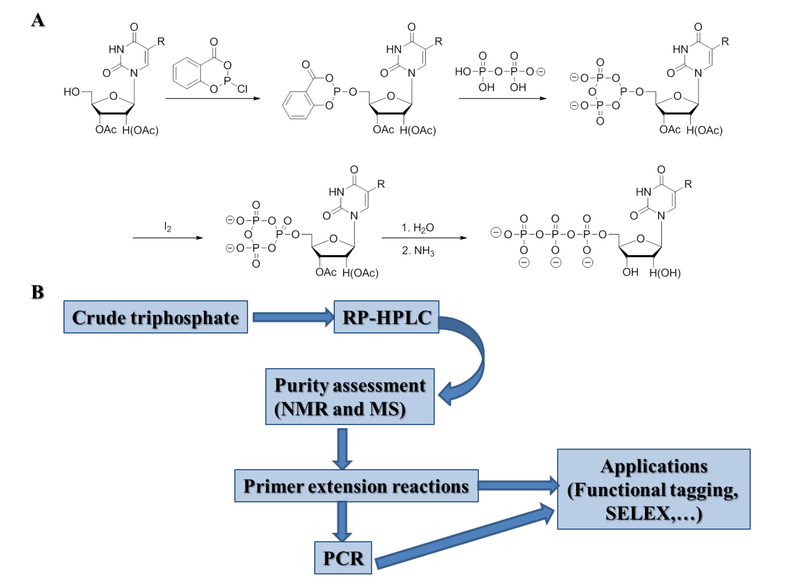 In summary, the method for the synthesis and characterization of modified nucleoside triphosphates was emphasized and the establishment of such a protocol will certainly help in the development and crafting of novel analogues. Concomitantly, the emergence of such novel dNTPs will facilitate the generation of functionalized oligonucleotides; particularly, catalytic nucleic acids. This work was supported by the Swiss National Science Foundation (Grants n° PZ00P2_126430/1 and PZ00P2_144595). Prof. C. Leumann is gratefully acknowledged for providing the lab space and equipment, as well as for his constant support. Ms. Sue Knecht is acknowledged for fruitful discussions. Hocek, M., Fojta, M. Cross-coupling reactions of nucleoside triphosphates followed by polymerase incorporation. Construction and applications of base-functionalized nucleic acids. Org. Biomol. Chem. 6, 2233-2241 (2008). Hollenstein, M. Nucleoside Triphosphates - Building Blocks for the Modification of Nucleic Acids. Molecules. 17, 13569-13591 (2012). Lauridsen, L. H., Rothnagel, J. A., Veedu, R. N. Enzymatic Recognition of 2'-Modified Ribonucleoside 5'-Triphosphates: Towards the Evolution of Versatile Aptamers. ChemBioChem. 13, 19-25 (2012). Roychowdhury, A., Illangkoon, H., Hendrickson, C. L., Benner, S. A. 2'-Deoxycytidines Carrying Amino and Thiol Functionality: Synthesis and Incorporation by Vent (Exo-) Polymerase. Org. Lett. 6, 489-492 (2004). Dewey, T. M., Mundt, A. A., Crouch, G. J., Zyzniewski, M. C., Eaton, B. E. New Uridine Derivatives for Systematic Evolution of RNA Ligands by Exponential Enrichment. J. Am. Chem. Soc. 117, 8474-8475 (1995). Kuwahara, M., et al. Direct PCR amplification of various modified DNAs having amino acids: Convenient preparation of DNA libraries with high-potential activities for in vitro selection. Bioorg. Med. Chem. 14, 2518-2526 (2006). Jäger, S., Famulok, M. Generation and Enzymatic Amplification of High-Density Functionalized DNA Double Strands. Angew. Chem. Int. Ed. 43, 3337-3340 (2004). Thum, O., Jäger, S., Famulok, M. Functionalized DNA: A New Replicable Biopolymer. Angew. Chem. Int. Ed. 40, 3990-3993 (2001). Jäger, S., et al. A versatile toolbox for variable DNA functionalization at high density. J. Am. Chem. Soc. 127, 15071-15082 (2005). Vaught, J. D., et al. Expanding the Chemistry of DNA for in Vitro Selection. J. Am. Chem. Soc. 132, 4141-4151 (2010). Sakthivel, K., Barbas, C. F. Expanding the Potential of DNA for Binding and Catalysis: Highly Functionalized dUTP Derivatives That Are Substrates for Thermostable DNA Polymerases. Angew. Chem. Int. Ed. 37, 2872-2875 (1998). Raindlová, V., Pohl, R., Hocek, M. Synthesis of Aldehyde-Linked Nucleotides and DNA and Their Bioconjugations with Lysine and Peptides through Reductive Amination. Chem. Eur. J. 18, 4080-4087 (2012). Hollenstein, M. Deoxynucleoside triphosphates bearing histamine, carboxylic acid, and hydroxyl residues – Synthesis and biochemical characterization. Org. Biomol. Chem. 11, 5162-5172 (2013). Cheng, Y., et al. Synthesis, and Polymerase-Catalyzed Incorporation of Click-Modified Boronic Acid-TTP Analogues. Chem. Asian J. 6, 2747-2752 (2011). Lin, N., et al. Design and synthesis of boronic-acid-labeled thymidine triphosphate for incorporation into DNA. Nucleic Acids Res. 35, 1222-1229 (2007). Schoch, J., Jäschke, A. Synthesis and enzymatic incorporation of norbornenemodified nucleoside triphosphates for Diels–Alder bioconjugation. RSC Adv. 3, 4181-4183 (2013). Biomol Chem, O. rg 9, 7482-7490 (2011). Hollenstein, M. Synthesis of deoxynucleoside triphosphates that include proline, urea, or sulfamide groups and their polymerase incorporation into DNA. Chem. Eur. J. 18, 13320-13330 (2012). Ikonen, S., Macíčková-Cahová, H., Pohl, R., Šanda, M., Hocek, M. Synthesis of nucleoside and nucleotide conjugates of bile acids, and polymerase construction of bile acid-functionalized DNA. Org. Biomol. Chem. 8, 1194-1201 (2010). Baccaro, A., Steck, A. -L., Marx, A. Barcoded Nucleotides. Angew. Chem. Int. Ed. 51, 254-257 (2012). Santoro, S. W., Joyce, G. F., Sakthivel, K., Gramatikova, S., Barbas, C. F. RNA cleavage by a DNA enzyme with extended chemical functionality. J. Am. Chem. Soc. 122, 2433-2439 (2000). Sidorov, A. V., Grasby, J. A., Williams, D. M. Sequence-specific cleavage of RNA in the absence of divalent metal ions by a DNAzyme incorporating imidazolyl and amino functionalities. Nucleic Acids Res. 32, 1591-1601 (2004). Perrin, D. M., Garestier, T., Hélène, C. Bridging the gap between proteins and nucleic acids: A metal-independent RNAseA mimic with two protein-like functionalities. J. Am. Chem. Soc. 123, 1556-1563 (2001). Hollenstein, M., Hipolito, C., Lam, C., Dietrich, D., Perrin, D. M. A highly selective DNAzyme sensor for mercuric ions. Angew. Chem. Int. Ed. 47, 4346-4350 (2008). Hollenstein, M., Hipolito, C. J., Lam, C. H., Perrin, D. M. A self-cleaving DNA enzyme modified with amines, guanidines and imidazoles operates independently of divalent metal cations (M2). Nucleic Acids Res. 37, 1638-1649 (2009). Hollenstein, M., Hipolito, C. J., Lam, C. H., Perrin, D. M. A DNAzyme with Three Protein-Like Functional Groups: Enhancing Catalytic Efficiency of M2+-Independent RNA Cleavage. ChemBioChem. 10, 1988-1992 (2009). Hollenstein, M., Hipolito, C. J., Lam, C. H., Perrin, D. M. Toward the Combinatorial Selection of Chemically Modified DNAzyme RNase A Mimics Active Against all-RNA Substrates. ACS Comb. Sci. 15, 174-182 (2013). Hipolito, C. J., Hollenstein, M., Lam, C. H., Perrin, D. M. Protein-inspired modified DNAzymes: dramatic effects of shortening side-chain length of 8-imidazolyl modified deoxyadenosines in selecting RNaseA mimicking DNAzymes. Org. Biomol. Chem. 9, 2266-2273 (2011). Lam, C. H., Hipolito, C. J., Hollenstein, M., Perrin, D. M. A divalent metal-dependent self-cleaving DNAzyme with a tyrosine side chain. Org. Biomol. Chem. 9, 6949-6954 (2011). Wiegand, T. W., Janssen, R. C., Eaton, B. E. Selection of RNA amide synthase. Chem. Biol. 4, 675-683 (1997). Battersby, T. R., et al. Quantitative Analysis of Receptors for Adenosine Nucleotides Obtained via In Vitro Selection from a Library Incorporating a Cationic Nucleotide Analog. J. Am. Chem. Soc. 121, 9781-9789 (1999). Latham, J. A., Johnson, R., Toole, J. J. The application of a modified nucleotide in aptamer selection: novel thrombin aptamers containing -(1-pentynyl)-2'-deoxyuridine. Nucleic Acids Res. 22, 2817-2822 (1994). Masud, M. M., Kuwahara, M., Ozaki, H., Sawai, H. Sialyllactose-binding modified DNA aptamer bearing additional functionality by SELEX. Bioorg. Med. Chem. 12, 1111-1120 (2004). Shoji, A., Kuwahara, M., Ozaki, H., Sawai, H. Modified DNA aptamer that binds the (R)-Isomer of a thalidomide derivative with high enantioselectivity. J. Am. Chem. Soc. 129, 1456-1464 (2007). Yu, H., Zhang, S., Chaput, J. C. Darwinian Evolution of an Alternative Genetic System Provides Support for TNA as an RNA Progenitor. Nat. Chem. 4, 183-187 (2012). Davies, D. R., et al. Unique motifs and hydrophobic interactions shape the binding of modified DNA ligands to protein targets. Proc. Natl. Acad. Sci. USA. 109, 19971-19976 (2012). Kuwahara, M., Sugimoto, N. Molecular Evolution of Functional Nucleic Acids with Chemical Modifications. Molecules. 15, 5423-5444 (2010). Burgess, K., Cook, D. Syntheses of Nucleoside Triphosphates. Chem. Rev. 100, 2047-2059 (2000). Ludwig, J., Eckstein, F. Rapid and efficient synthesis of nucleoside 5'-0-(1-thiotriphosphates), 5'-triphosphates and 2',3'-cyclophosphorothioates using 2-chloro-4H-1,3,2-benzodioxaphosphorin-4-one. J. Org. Chem. 54, 631-635 (1989). Williams, D. M., Harris, V. H. Chapter 3. Organophosphorus Reagents: A Practical Approach in Chemistry. Murphy, J. 9, Oxford University Press. 237-275 Forthcoming. Hocek, M., Fojta, M. Nucleobase modification as redox DNA labelling for electrochemical detection. Chem. Soc. Rev. 40, 5802-5814 (2011). Kurreck, J. Antisense technologies - Improvement through novel chemical modifications. Eur. J. Biochem. 270, 1628-1644 (2003). Wilson, C., Keefe, A. D. Building oligonucleotide therapeutics using non-natural chemistries. Curr. Opin. Chem. Biol. 10, 607-614 (2006). Krueger, A. T., Kool, E. T. Model systems for understanding DNA base pairing. Curr. Opin. Chem. Biol. 11, 588-594 (2007). Krueger, A. T., Lu, H., Lee, A. H. F., Kool, E. T. Synthesis and Properties of Size-Expanded DNAs: Toward Designed, Functional Genetic Systems. Acc. Chem. Res. 40, 141-150 (2007). Wojciechowski, F., Leumann, C. J. Alternative DNA base-pairs: from efforts to expand the genetic code to potential material applications. Chem. Soc. Rev. 40, 5669-5679 (2011). Weisbrod, S. H., Marx, A. Novel strategies for the site-specific covalent labelling of nucleic acids. Chem. Commun. 30, (44), 5675-5685 (2008). Lim, S. E., Copeland, W. C. Differential Incorporation and Removal of Antiviral Deoxynucleotides by Human DNA Polymerase γ. J. Biol. Chem. 276, 23616-26623 (2001). Cho, Y., Kool, E. T. Enzymatic Synthesis of Fluorescent Oligomers Assembled on a DNA Backbone. ChemBioChem. 7, 669-672 (2006). Hollenstein, M., Wojciechowski, F., Leumann, C. J. Polymerase incorporation of pyrene-nucleoside triphosphates. Bioorg. Med. Chem. Lett. 22, 4428-4430 (2012). Kuwahara, M., et al. Smart conferring of nuclease resistance to DNA by 3'-end protection using 2',4'-bridged nucleoside-5'-triphosphates. Bioorg. Med. Chem. Lett. 19, 2941-2943 (2009). Horáková, P., et al. Tail-labelling of DNA probes using modified deoxynucleotide triphosphates and terminal deoxynucleotidyl tranferase. Application in electrochemical DNA hybridization and protein-DNA binding assays. Org. Biomol. Chem. 9, 1366-1371 (2011). Motea, E. A., Berdis, A. J. Terminal deoxynucleotidyl transferase: The story of a misguided DNA polymerase. Biochim. Biophys. Acta. 1804, 1151-1166 (2010).